A novelty at Tucson 2017. Aggregate on matrix of very sharp laminar crystals, bright and with a very well defined pseudohexagonal contour. 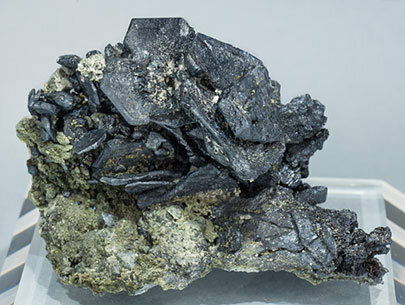 The analysis indicates an intimate intergrowth of Djurleite and Chalcocite. We’ll send a copy of the analysis to the buyer. A novelty at Tucson 2017. 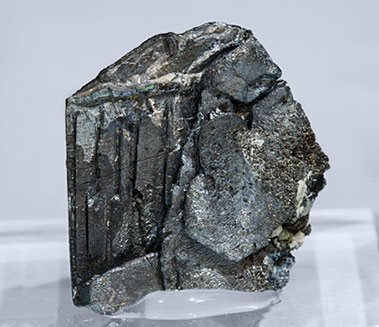 Parallel growth of very flattened and bright crystals. These samples were mined carefully over seven months in the Aït Ahmane area (it seems not in the same shafts that produced the famous Gersdorffites) and, due the sharpness of the crystals and their size, this find will contend for being the world's best for the species. We’ll send to the buyer a copy of the analysis that indicates an intimate intergrowth of Djurleite and Chalcocite. A novelty at Tucson 2017. 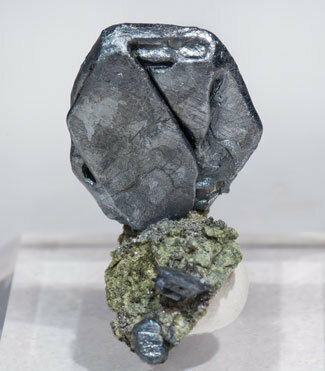 Djurleite-Chalcocite (intergrowth) mined carefully over 7 months in the Aït Ahmane area (it seems that not in the same shafts that produced the famous Gersdorffites) and presented for the first time in Tucson 2017. We believe that for the sharpness of the crystals and their size this find will highlight Aït Ahmane as one of the world's best localities for this not so common species. We will send a copy of the analysis to the buyer. A novelty at Tucson 2017. 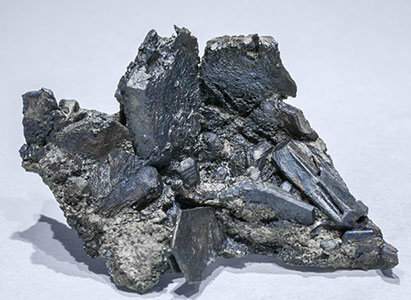 Djurleite-Chalcocite (intergrowth) mined carefully over 7 months in the Aït Ahmane area (it seems that not in the same shafts that produced the famous Gersdorffites) and presented in Tucson 2017. A novelty at Tucson 2017. Aggregate on matrix of bright laminar crystals with pseudohexagonal contour. 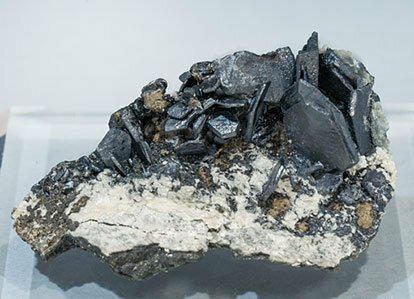 The analysis indicates an intimate intergrowth of Djurleite and Chalcocite. We’ll send a copy of the analysis to the buyer. 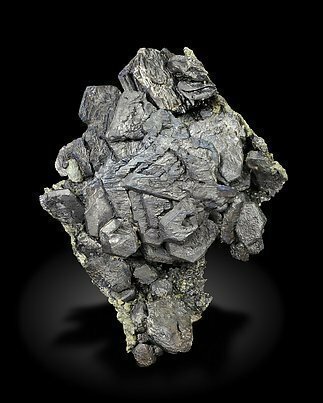 This specimen was published on the Mineralogical Record´s web page, in the ‘What's New’ section, report 46, April 14, 2017 edition. A novelty at Tucson 2017. 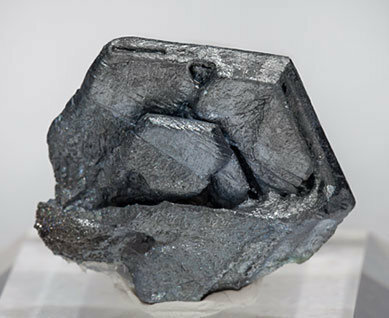 A cluster, on matrix, of very sharp and flattened crystals with a pseudohexagonal contour. These samples were mined carefully over seven months in the Aït Ahmane area (it seems that not in the same shafts that produced the famous Gersdorffites) and, due the sharpness of the crystals and their size, this find will highlight between the world's best for the species. We’ll send to the buyer a copy of the analysis that indicates an intimate intergrowth of Djurleite and Chalcocite. There are few good Djurleites left from the ones recovered at the Aït Ahmane Mine between 2014 and 2015. We were lucky to be able to gain access to the finest pieces during Tucson 2017 and we still have some of great quality. This one in particular is the best we have left. 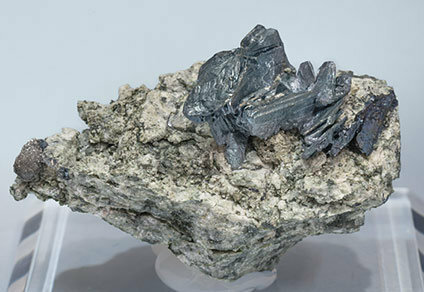 These large crystals with good definition, both on the front and on the back, and with some minor matrix makes an excellent specimen.